There are certain common friction points between kids and parents: getting up, getting dressed, getting out the door, meal times, bedtimes... geez, listing it out, it seems like there are A LOT of potential sources for frustration. Today I'm going to focus on a little example of how to gracefully manage just one of these, and that's getting your child dressed in the morning. Mind you, this is a suggestion for early to late school age kids, not your babies or toddlers. But if you're having difficulty with your wee one, drop me a line and we can talk. We're changing seasons here in the Northeast U.S. and that means an awful lot of children being forced to some times bundle up, or some times not. It's confusing enough for adults to figure out the "how many layers or none at all?" question, particularly given that the weather has been strangely mild but with sudden dips in temperature. Unsurprisingly, children balk at being made to pile on clothes when bare legs and unencased wiggly toes can be more comfortable. So what to do when you know they'll be cold outside and your darling child decides to dress for Miami weather? Well, a dad I'm working with came up with an elegant solution for his daughter and wife's daily power struggle over getting dressed. The mom had been fighting daily with the daughter about putting pants on, usually ending in tears and aggravation. The child would go outside but the mom would end up pulling pants on her outside on the sidewalk, which was not ideal. And the upset it caused was not a great way to launch anyone on their day. So how to find a win-win solution? The dad proposed setting up a thermometer outside, and creating a routine whereby the daughter would check the temperature upon waking. Ahead of time, the family would set up a chart with pictures of appropriate outdoor clothing for each band of temperature. So 60 degrees would mean pants with a sweater and light coat, 70 degrees would mean a dress was ok. I love this idea because it sets limits, by providing expectations and guidance from the parents, while also having the child take control by checking the weather. Now it's the child's responsibility to consult the chart to see what to wear. Mom and dad are respecting their daughter's agency while guiding her to make good decisions. Have you tried this out? Have your own win-win solutions for getting your child dressed? Let me know! Is your anxiety making you a controlling parent? "In an uncertain world, we often feel desperate for absolutes. It's the human response to fear." I think all parents feel a certain amount of "am I doing this right?!" anxiety. The stakes seem so incredibly high. We don't want to mess our kids up. And lets face it, when it comes to parenting, uncertainty abounds. So, we read pregnancy or parenting books. We ask the mom whose baby is napping what her secret is. We troll blogs or Facebook looking for answers or reassurance. Basically, we just want to know that it'll be ok. That we're doing the right thing for our kids. That we're not being too permissive, or too strict, too controlling or too lax. We're always waiting to feel like we've finally got this parenting thing figured out. For some, a certain rigidity starts to take hold, as that fear of messing up wraps it's cold tentacles around our hearts. That fear is so uncomfortable, that we start to seek absolutes, clear-cut "must do it this way or else!" methods. As if there were one right way, one trick, one secret to getting kids to nap, or to potty train them or to get them to do their homework. Somehow if we could just figure out that trick, the rest would be so much easier. So in response, we get controlling and rigid, instead of flexible and curious. And guess what results when kids feel controlled? They push back. They whine. And everything feels like more of a battle. Pretty draining, right? I get asked pretty often-- "what's the difference between coaching and therapy?" Well for starters, therapy focuses on you and oftentimes addresses symptoms such as depression or anxiety. As a parent, when you aren't feeling like yourself, it can have real ramifications for the rest of the family. It is key to take the time to get relief, both for your sake and for your family's. I urge parents to incorporate counseling, meditation, exercise and slowing down to help address the emotions that are interfering in your day-to-day. For some folks, a session or two is all it takes to "right the ship." For others with more long standing symptoms (eg, "I've always been a worrier,"), it may take a bit longer to shift those thoughts and feelings. But it can be done! In therapy, I use a combination of Cognitive Behavioral Therapy (CBT) and supportive therapies, with a strong focus on self care and self regulation. CBT has a fairly intuitive underlying concept, namely that your thoughts affect your feelings and behaviors. Helping clients examine their negative, distorted thoughts using a more balanced and realistic lens can make a huge difference both as a person and a parent. While in parenting coaching we certainly look at how you are doing, the main focus is on improving the relationship with your child. As a parent, I know how easy it is to get overwhelmed and having some outside help can really help shift the negative dynamics at play at home. 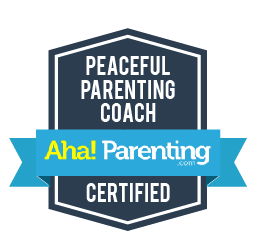 The peaceful parenting approach is practical, and it works. There are three main ideas. The first is the need to regulate yourself as a parent. So, stopping yourself from yelling, pausing to breathe and not reacting as if the situation is an emergency is key. The next and most important piece is fostering connection. We truly cannot force our kids to comply--instead we have to use the power of our relationship. This means taking the time to connect and build a warm, loving relationship so that our child will not want to endanger that connection, and will instead, follow our guidance. The last part, is to coach and not to control our kids. Studies have shown that spanking and time outs are truly ineffective as means of guidance. When children misbehave, it's actually a sign that there is something wrong physically (hunger, fatigue) or within the relationship, but not with the child. Mind you, this is not permissive parenting, where anything goes and the child has the run of the house. On the contrary, the idea is to maintain limits but use empathy to see your child's point of view. So would you like to work on you or on your relationship with your child? In some cases, I even offer a bit of both coaching and therapy, which can be a good option as well. I am happy to speak and offer additional guidance on which option is best for you. So, bam...here you are. Baby? Check! Friends? Not so much. In a city teeming with parents pushing strollers, it's strangely easy to feel isolated. But stopping a random mom and asking "Can you be my mommy friend? Please!?" isn't necessary. Finding your parenting tribe is easier than you think. In New York City and especially in Brooklyn, each neighborhood has a parenting listserv where parents right in your area post questions, sell baby stuff, list baby classes and set up play dates. These listservs are super resources and are a great place to start to get connected to the parenting world. Below is a link to a list of most of the local NYC listservs, but if you don't see your neighborhood represented, go to groups.yahoo.com and search out your own neighborhood to see if there is a group nearby. Chances are good that you'll find one.